Daily Illuminator: Triplanetary Kickstarter Closing Soon! February 8, 2018: Triplanetary Kickstarter Closing Soon! After a successful orbit around the solar system, Triplanetary is coming to rest back on earth, closing out the highly successful Kickstarter campaign this Friday. If you've been living on the moon for the last month (and who could blame you, it's great this time of year), Triplanetary is the game of space combat, and movement, in the solar system. Celebrating the 45th anniversary of this game, this new edition of Triplanetary has been a long time coming, since the promise made by Steve in 1990. Turned out 1990 was a pretty eventful year for us, so it's taken this long to see the light of day. But Steve was committed to the promise, and as a huge fan of the game himself has wanted a new edition for some time. Our version will include a mounted game board with dry-erase marker-friendly surfacing to track movement. This game uses vector movement to simulate momentum, with the strategy coming from your fuel consumption. Fuel is precious, so making use of planetary gravity while you propel through the stars is important. But why take it from me, when Steve can explain the finer points of movement in our quick demo? This isn't going to be a huge printing, so make sure you reserve your copy now or pledge at the retailer level if you want to stock it in your store. 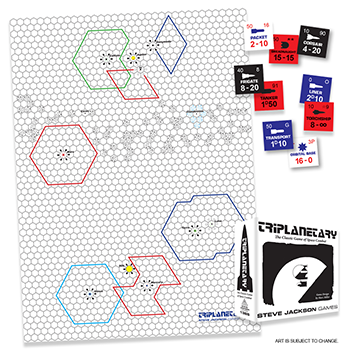 The Triplanetary campaign ends tomorrow!